KKSR#5104 DIRECT OCEANFRONT, BEST GROUND FLOOR CORNER! REMODELED! AC!!!! Welcome to #5-104! The very best ground floor corner unit in the complex! Spectacular 270 degree ocean views!! Direct oceanfront living at its finest! The Lanai! Absolutely amazing Ocean & Golf Course Views! Lots of seating available for your group!! 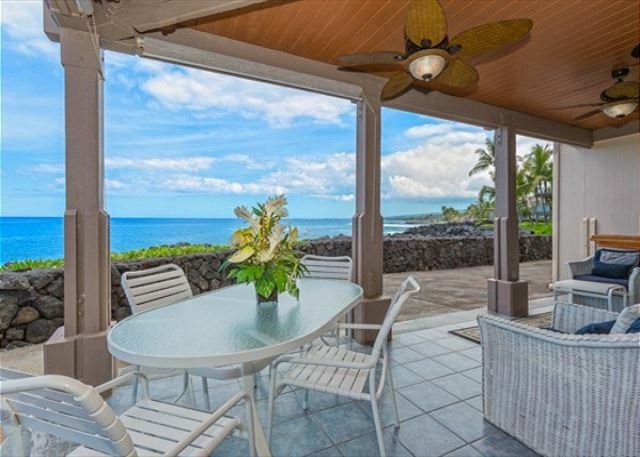 Beautiful Coastline Views from your Lanai looking South! Fans everywhere for your comfort. #5-104 comes with a wine cooler!! Rare & fantastic offering!! This kitchen is fully equipped with absolutely everything one could need!! The Kitchen has all stainless steel appliances!! Front Bedroom has an amazing King Sized Bed with Direct Ocean Views!! Wake up to the ocean!! 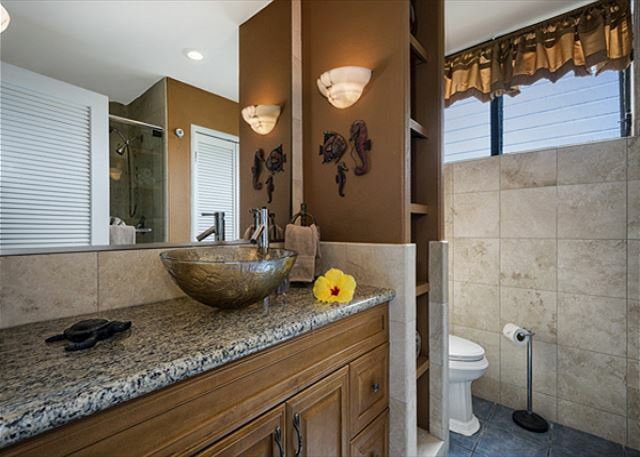 GORGEOUS VESSEL SINKS, Both bathrooms are entirely remodeled. This bathroom has a walk in shower with Shampoo/Conditioner/Soap dispensers!! Bedroom Near Golf Course has 2 twin beds! Lots of room to relax!! View to the North! COASTLINE VIEWS!! Follow your own private path to #5-104!! Aloha!!!! Beautiful Pool area remodeled in 2016! North Facing Views of Kailua Bay! DIRECTLY from your Lanai!! It's time to book your Vacation in #5-104!! Direct Oceanfront Living at it's finest. Building 5, the absolute best Surf & Racquet Club has to offer. 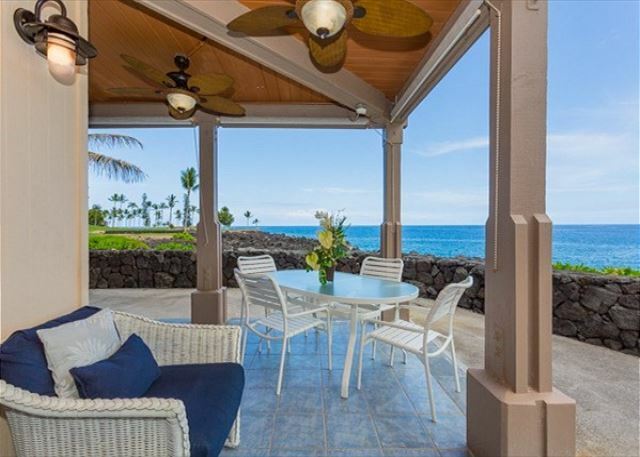 Keauhou Kona Surf & Racquet Club#5-104 DIRECT OCEANFRONT, BEST GROUND FLOOR CORNER! REMODELED! AMAZING NEW PROPERTY BOOKING SPECIALS!! AIR CONDITIONING INSTALLED AS OF NOVEMBER 2017!! BRAND NEW SPLIT AC UNITS INSTALLED IN LIVING ROOM, & BOTH BEDROOMS!! RARE & PHENOMENAL AMENITY OFFERED IN SURF & RACQUET COMPLEX!! Welcome to unit #5-104 at the Keauhou Kona Surf & Racquet Club! Knutson & Associates Property Management is so proud to be newly representing this absolutely breathtaking corner unit. #5-104 is a immaculate, remodeled ground floor unit in the best building that Keauhou Kona Surf & Racquet Club has to offer: Building 5! A 270 degree direct oceanfront view from your living area that leaves people speechless! 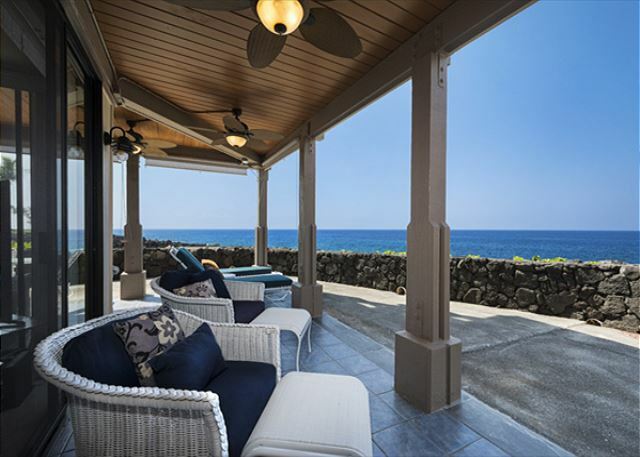 A HUGE L shaped Lanai that allows you to walk out and enjoy the jaw dropping coast line & Golf Course Views. You feel like you're in your own world staying at this property. This end unit offers unsurpassed privacy, plus extra windows for a light and open feel not often found with condominiums. You'll love having no parking lot around this property for additional quiet and serenity only found in building #5. Notable features that many guests have loved: Granite Counter tops in a Fully Equipped Kitchen with Stainless Steel Appliances & Wine Cooler! Both bathrooms have these gorgeous glass vessel sinks with glass block walk in showers! The back bedroom is surrounded by tropical vegetation & Golf Course Views.. The front bedroom has a King Sized with a direct oceanfront view!. 2 twins in the back bedroom! Direct oceanfront views from this bedroom! You can comfortably sleep 4 people total in this nearly 1200 square foot luxury condominium. Only 3 units in this entire complex have this kind of view. #5-104 is a rare and spectacular property loved by even the most discriminating. 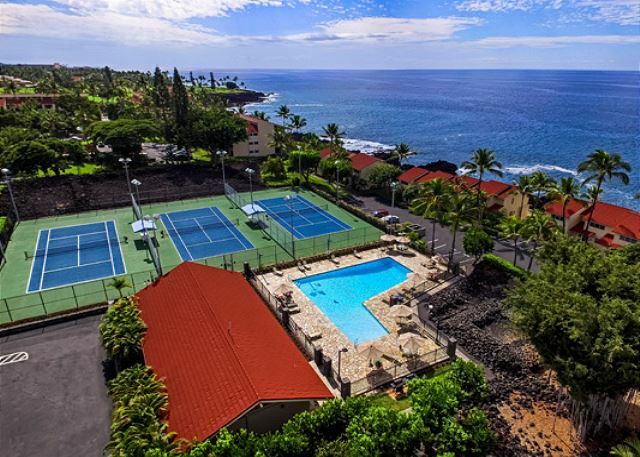 The Keauhou Surf and Racquet Club is a gated community of condominiums. There are three professional style tennis courts with night lighting; a tennis pro is on hand daily for lessons or game improvement coaching. The large, newly remodeled swimming pool (Redone in 2016) is ideal for “laps” and also for small children water activities. Showers and restrooms are conveniently located in the large pavilion near the swimming pool and tennis courts. 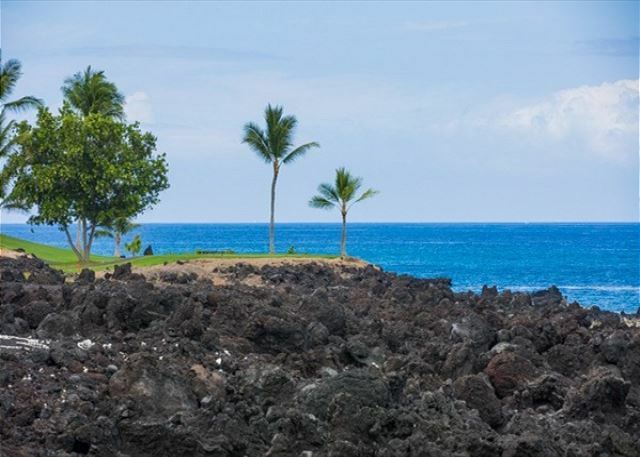 One of the most interesting features of the Keauhou Surf and Racquet Club are the numerous archaeological sites. These preserved areas provide a glimpse of Hawaiian life years ago. Each site has a posted description of the activities that took place years and years ago. The Keauhou Surf and Racquet Club has many gardens and walking trails. ONE GOES DIRECTLY TO A BEACH!! Flowers and tropical foliage are abundant. There are several outdoor barbeque areas for guests to go to. **If link is not shown, inquire directly within to obtain it!! We enjoyed our stay right next to the ocean! The view was spectacular and it was nice to listen to the waves all night. It was great having an A/C and the condo was updated beautifully. We would highly recommend this property to anyone and we can't wait to come back and stay again! Very clean & well stocked oceanfront rental at the end of the pedestrian walk, so there is almost no foot traffic making this unit quite private. It is on a black magma bluff & there is no swim beach below, but the wave action against the cliffs make for a changing view plus if you are in the master bedroom, for relaxing sleep while listening to same. No TV in master but with the waves, who cares? This condo is as described and has an amazingly private and gorgeous view of the ocean! We enjoyed the lanai for early morning coffee, happy hours and amazing sunsets. We would definitely recommend this property and hope to return to it ourselves someday! Vacation rental experience started with accurate description and pictures of condo. Terms were very reasonable and management were professional and timely. We loved the condo, it's location, and especially the privacy of the end unit and beautiful view. We so appreciated the AC for sleeping, for the winds died down for periods of time every day. A great trip! Mahalo for the kind review, Terry! We're so happy to hear how pleased you were with your stay, and would love to have you in Kona with us again! We stayed in this complex before. So we knew the grounds were beautiful. But this unit was amazing! The lanai was huge! I didn’t want to go inside! The condo had everything you could ever need, was supper clean, and very modern. The air conditioner was awesome to have because it was crazy hot. I would definitely stay here again!! I highly recommend this unit!! 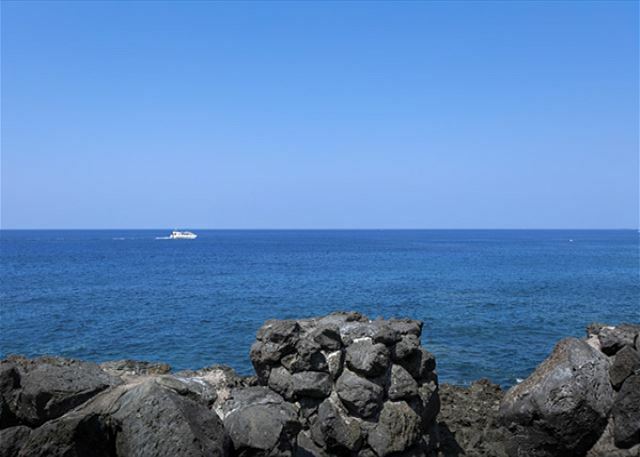 We're happy to hear that you were able to enjoy all the amenities of the property and had such a great stay in Kona. Mahalo & we hope to accommodate you again! We have stayed at the Surf and Racquet Club before, but when we walked into our unit (I hate to call it a "unit") we were blown away. 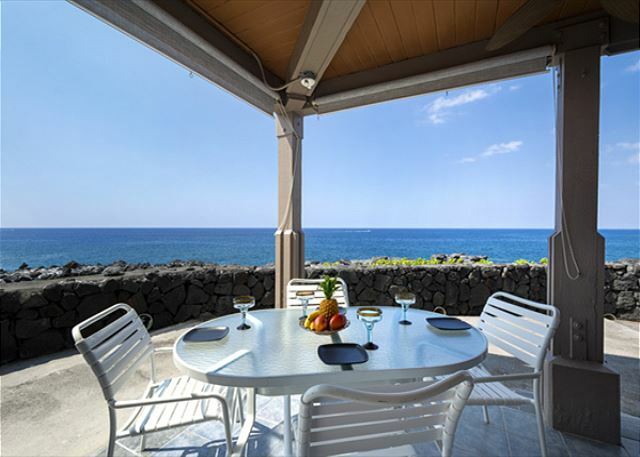 Beautifully decorated and perched right on the ocean, it is the perfect place to stay while in the Kailua Kona area. The open floor plan with floor to ceiling sliders brings the outside inside. We were there in the middle of the summer and never turned on the air conditioner. If we were not exploring all the things to do in Kona, you could find us resting/reading/playing guitar in very comfortable chairs on the wrap around lanai. We also do a lot of cooking while we vacation, and the well-equipped kitchen was a delight to work in. Everything you need is there, including a temperature controlled wine storage. 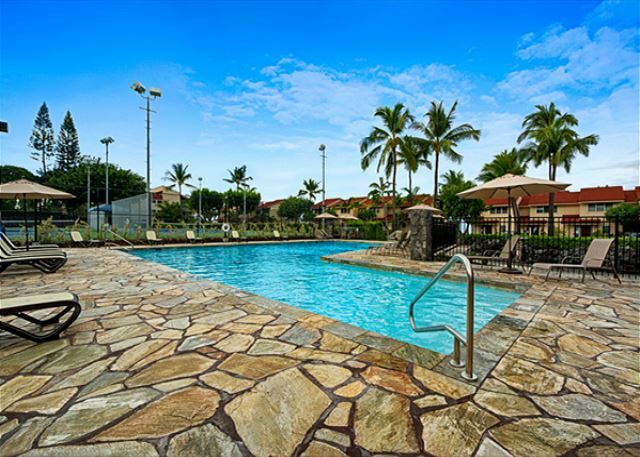 I have stayed at many places in the Kailua/Keauhou area over the years, and this is the best! Beautiful end unit with a 180 degree view. Great ocean front rental. Relaxing to sit on the lanai and watch the waves crashing in the rocks. Well equipped kitchen. This property is BEAUTIFUL. Everything you would ever need is there in the condo. Location gets you out of town which was nice yet easy access to a shopping mall and a short drive into town. Sitting on the lanai and watching the sunset was the best part. There were a few items in the kitchen that needs to be corrected. There was no sink stopper. There needs to be more small drinking glasses. The plates are chipped and need to be replaced. There needs to be more serving dishes. Other than these minor things, it is a wonderful location. This condo is very comfortable, love the outdoor furniture and view of ocean, great location as it is close to White Sands Beach, Captain Cook, shopping plaza. Just perfect for us. We will come back again. Spectacular ocean views! Large comfortable sofa's and a good master mattress. Big open living room sliding doors and clean inside. Large kitchen and everything you’ll need to prepare meals. Local grocery market just minutes away. The management was also very easy to work with. No AC - afternoons were on the humid warm side. We slept with all the windows open at night get the cool ocean cross breezes. We will definitely stay again next time in Kona. The view from our lanai was fabulous! Four women , in our 50's and 60's, enjoyed the week we spent at this location. This was my 5th trip to Big Island and it was one of the best ocean views I've experienced. The large "L" shaped lanai provided plenty of room to sit or recline while watching sailboats, canoes, kayaks and occasionally dolphins going by. The condo was supplied with a variety of items for beach use, chairs, towels, sunscreen, cool chests, etc. The kitchen had plenty of cook wear and dishes as well as most items one would need for meal preparation. The one disappointment was that both the screens and the glass sliding doors were very difficult to open and shut. Getting them locked and unlocked was a pain. This place is awesome! Great place to relax with a fantastic view of the ocean. 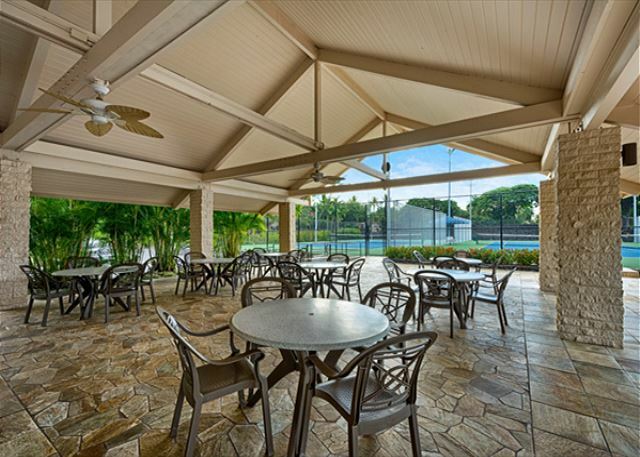 Convenient location with comfortable furniture inside and on the spacious lanai. Wonderful rental right on the water. If we end up in Kona again I'll be booking this condo. Stayed at this beautiful condo for our 40th Anniversary and it was all we had hoped! Watching the sunset from the lanai was spectacular ! Very private being the end unit which made us feel like we were there alone. Very well kept, with everything there you would need to make your stay perfect! A great condo set right along the ocean. This is a corner unit on the ground floor and you have access to a beautiful lanai from both the bedroom and living room. We enjoyed many sunsets, huge waves and even saw some whales! First time in Hawaii but have stayed in several properties throughout the world. We're travel people!! This was one of our best condo experiences by far. Gorgeous and comfortable. VERY CLEAN. Owners & Property Management company have provided everything we needed! Treated with true hospitality!! We enjoyed the AMAZING view from the lanai. Kitchen had absolutely everything we could possibly need. Thank you for an amazing time! Our experience was wonderful. We met Blake at his office because we arrived in Kona a little before check in. Blake let us store our luggage as we enjoyed a round of golf. After golf, Blake guided us to the property, and insisted upon helping us with our luggage. The corner Lanai was gorgeous, offering wonderful views of the ocean and the golf course. While not air conditioned, we had no problem, as we just opened the screens and the tropical breeze cooled us just fine. The bed was great, we slept well. The furniture was comfortable and there as a huge flat screen!! The location was just great to allow us to explore Kona, while still being a bit off the beaten path. Pool/tennis courts were amazing. Only minor issue was that the doors and windows locked, but screens did not. I expect the new property managers will fix that quickly. The condo was chock full of everything you needed - blankets, snorkeling gear, everything you need for your Kona adventure. We will never forget our trip to Kona staying at the Keauhou Kona surf and Racquet Club. I expect we will return sooner, not later. Outstsnding. Especially Blake's attention, accommodations, and efficiency. World's best location and view.every answer below is 5 stars. We stayed three nights at this rental and it was my favorite out of the whole trip! Very comfortable unit with the best location of the whole complex. The complex is gated, clean and well maintained. Amenities include tennis courts, BBQ pits and pool which we didn't use. The pool is for "residents" only, not sure on rules for the courts. There's a semi-private beach on the other side of the complex, good for walking but not swimming. Neighbors are friendly/talkative, though some may think them nosy/intrusive. We had no issues with noise or loud groups. 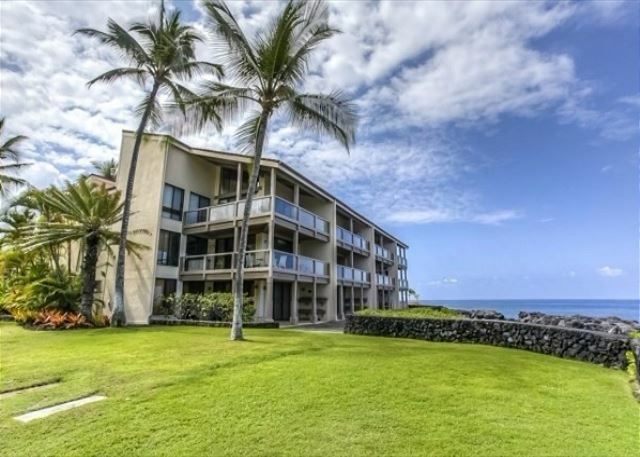 The unit is next to the golf course with walkable paths at sunset where you can walk by a blowhole in the lava rocks. Views of the sunset are unbeatable! Lanai is somewhat public access, but we only had strangers cross a couple times who were out to take in the views. Complex is also near shopping complex with many restaurants, large grocery store. It is just down to street from great snorkeling beach (Kahaluu). The unit was well equipped with kitchen basics, bathrooms had towels and shampoo dispensers, we especially enjoyed the beach gear ranging from chairs, umbrellas, boogie boards, snorkel gear, beach towels etc. I loved the in unit washer/dryer. Beds were comfortable for my girls (age 3/2) and master had spacious bed. There is no AC, but plenty of fans and windows to take advantage of cooler breezes. Internet and TV were included and we used without issues. Several additional touches like library of guide books, ipod stereo added to the experience. Would highly recommend this place. Well worth it! Almost a 360 degree view of the ocean. Nicely appointed. Rental staff very attentive to making your stay enjoyable. Worth a visit. Blake from the Management Group was GREAT to work with. Had some issues from the start and Blake made sure we were very satisfied with the condo. It is a beautiful condo with many great comfort items with an awesome location. a guest does not recommend this vacation rental. there were two large bowls of water instead of ice. Just some mistakes, I'm sure. There were very comfortable beds and furniture, but no lounge chairs on the lanai. There were some other issues, but I won't mention everything. Overall our stay was very nice. Blake from the management company was extremely helpful. This was one of the nicest condo's we have rented in the complex. It was clean and comfortable with an amazing view. We watched the sunsets, whales and dolphins. The BBQ was close, parking easy, close to shopping dining and food. All in all it doesn't get much better. A 5 star experience! The veiws are spectacular and unending. We saw whales and dolphins from our patio!